When accessorizing your favorite belongings, such as clothing, jewelry and more, you can easily do so with Swarovski Crystal rivets. 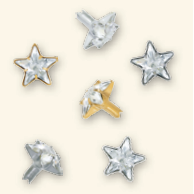 At Rainbows of Light, we have an assortment of Swarovski rivets to choose from, including 6mm Long Shank Crystal Rivets and square, or star shaped rivets. Whether you need a 6mm Pearl Rivet or 8mm Stainless Steel Rivet, you'll be satisfied with our collection. Before making a purchase, consider the project you’ll be using the rivets for, as this will help you select the most appropriate ones. For instance, the Stainless Steel was created to be used specifically against leather products, as it will not tarnish. 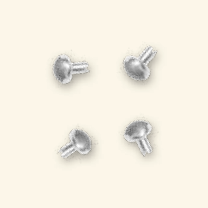 Whether you’re using a single rivet or as many more as you need, these high-quality rivets remain extremely durable. They make for the perfect way to customize any project, and because of their versatility, they provide a simple and classic way to accessorize. They work well on clothing as well as pet apparel and accessories. They look exceptionally great when clustered together for a detailed rich look and can also be used singly as an accent to a logo or if you like a simple touch of sparkle. 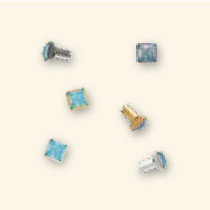 At Rainbows of Light, we have a vast selection of rhinestone rivets to choose from, making it simple for you to add flare and color to any of your projects. Our Round Rivets are a popular choice among many of our customers as well as 6mm Square Rivets. 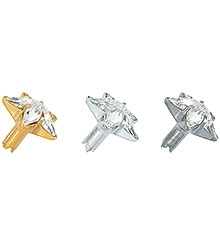 We even have rhinestone rivets with spike rivets. Because they are made out of tough metals, rivets are able to maintain their structure and durability throughout the installation process. You won't have to worry about the rivets breaking or chipping under normal conditions. The rivets are also resistant to corrosion, making them suitable for many applications such as accessorizing dog collars, belts, purses, shoes, apparel, and jewelry. When was the last time you gave your lovable furry friend a new sparkling collar? If it’s been awhile, you should definitely consider making something extra special for them. Applying Swarovski Crystal Rivets is exceptionally fast and easy with the hand-held Rivet press tool. The Rivets are punctured through the material and secured with a metal backing for long lasting results with brilliant sparkle. Don’t forget about accessorizing your own look either! Whether you want to update a pair of jeans, embellish a belt or create new jewelry, wholesale Swarovski Rivets come in a wide range of styles, crystal colors, and metal tones so that you can add an extra customized look that is all your own. 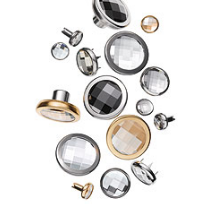 Using Swarovski Crystal Rivets is very popular for projects and accessories due to their strength and resilience. You can rest assured that your Rivets will stay securely in place, enduring the normal wear and tear accessories and dog collars go through, all the while providing you with the most radiant crystal in the world. No matter the project, Rainbows of Light has rivets that will work well and we can provide lots of advice on any projects that you want to perform.